An Indian PSLV rocket lifts off Nov. 28, 2018 at 11:28 p.m. Eastern with ISRO's HysIS satellite and 30 secondary payloads. 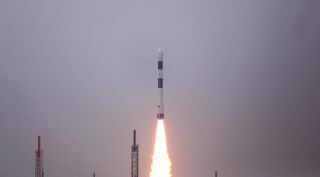 SAN FRANCISCO – In the wake of the March 27 Indian anti-satellite test, Brian Weeden of the Secure World Foundation suggested companies consider boycotting India's Polar Satellite Launch Vehicle (PSLV). Secondary payloads launching on PSLV generate significant income for Indian space programs. If India creates debris in low Earth orbit through anti-satellite testing that could harm the business models of PSLV's launch customers, Weeden tweeted. Many space industry startups also emphasize social responsibility in public statements and interviews. "I wonder if any commercial space companies are willing to take a stand on this and boycott the PSLV to send a message to India? Corporate social responsibility anyone?" Weeden, Secure World Foundation technical advisor, tweeted March 27. Related: India Says Anti-Satellite Test Created Minimal Debris. Is That True? Small satellite companies declined to comment on the likelihood of a boycott of the India Space Research Organization's PSLV. However, Planet condemned the anti-satellite test. "While Planet enjoys a great working partnership with agencies of India's government — like ISRO — we categorically condemn the anti-satellite missile intercept recently conducted by India's defense department," the San Francisco-based company tweeted March 27. "Space should be used for peaceful purposes, and destroying satellites on orbit severely threatens the long-term stability of the space environment for all space operators. Planet urges all space-capable nations to respect our orbital commons." Weeden said by email he was not calling for a boycott, but saying "the commercial sector should be concerned about where the space arms race is heading and how it may impact their business, and they should have a voice in the debate. A boycott is one possible way they could do that, but there may be others." While a single anti-satellite test is unlikely to cause significant debris, the Indian test is the latest sign "of the recent proliferation of anti-satellite and counterspace technologies," Weeden said. "Coupled with increased reliance on space for military purposes by many countries, it means there's a greater chance a future conflict may include attacks on satellites. And that could have devastating consequences for all, including commercialization and investment in space." Nations have been largely unsuccessful in reining in anti-satellite testing. Commercial companies with their expanding role both in the space industry and in global economies "could use their dollars and customers to also influence how countries behave in space. Countries aren't the only ones who can set and enforce norms of behavior." Terrestrial companies are taking stands on ethical and moral issues. Their positions influence where they operate and what countries they work with, Weeden said. "I wonder if we might start to see that happen in the space world as well," he added. Instead of focusing on India alone, companies "should probably consider the behavior of all countries pushing the space arms race," Weeden said. "India is only the latest, but by no means the only one." Laura Grego of the Union of Concerned Scientists also expressed concern about the spread of anti-satellite weapons and their increasing sophistication. "That increases the risks of a crisis getting sparked or escalated because someone uses or threatens to destroy someone else's critical national security satellite," Grego, a senior scientist in the Union of Concerned Scientists Global Security Program, said by email. Destroying a satellite with a ground-based missile as India, the United States and China have all done, "creates enormous amounts of space debris when used," Grego said. India destroyed a satellite at an altitude of 300 kilometers, meaning the cloud of debris created will not be in orbit long. Using a similar weapon to target "a satellite in a more common orbit would create debris that lasts decades," she said. "The international effort to ensure space remains a peaceful and secure environment is not keeping up with the spread of these technologies, and India's test makes it harder to see progress on that. In fact, it's possible that India's test encourages others to test, too," Grego said.